Is It Time to Shutter the Americas' 'Coup Academy'? General Manuel Antonio sits February 28, 1988 in Panama. This post is in partnership with Worldcrunch, a new global-news site that translates stories of note in foreign languages into English. The article below was originally published in AméricaEconomía. MEXICO CITY  Few of the hemisphere's training centers can boast as many ex-leaders and government strongmen among its graduates. For many schools, this would no doubt be an excellent marketing pitch. Not so for the School of the Americas (SOA). None of its famous alumni reached power by way of the voting booth. Some are even behind bars now, either convicted or facing prosecution in their respective countries for abuse of power. Created in 1946 by the U.S. government, the SOA was initially set up in Panama. During the Cold War, it was the primary training grounds for military hierarchies across Latin America. 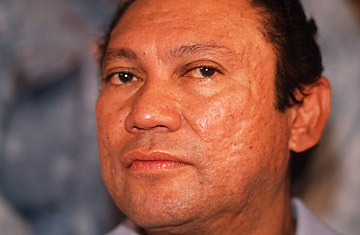 Among its more famous students is Manuel Noriega, who established a military dictatorship in Panama and is currently in prison in France, accused of working for the Medellín cocaine-trafficking cartel. Elias Wessin, who participated in the coup that toppled the Dominican Republic's Juan Bosh, also attended the academy, as did Hugo Banzer of Bolivia, who went on to become his country's dictator. Then there was the ex-president of Argentina, Roberto Eduardo Viola, and Vladimiro Montesinos, aid to former Peruvian President Alberto Fujimori. Montesinos oversaw Peru's intelligence service. He was later jailed for arms trafficking and corruption. The list goes on. SOA alumni have been actively connected to human rights violations throughout the region, first in their fight against the extreme left, and then in the fight against drug trafficking. In the end, many of them ended up allied with the drug traffickers themselves. In Venezuela, Gen. Efraín Vázquez, an SOA graduate, was involved in the failed coup d'état attempt against Hugo Chavez in 2002. This record was enough for some U.S. lawmakers to finally take a stand. Last August, 69 members of the House of Representatives (two republicans and 67 democrats) signed a letter to President Barack Obama asking him to close the Western Hemisphere Institute for Security Cooperation (Whinsec), as SOA was re-christened in 2001. Since opening, the school has changed names five times, "but not the curriculum," says Pablo Ruiz, spokesperson for SOA Watch (SOAW), an NGO that has worked to close the institution down. Lieutenant Zarza (a pseudonym) is one of 1,764 Mexican soldiers who have studied at SOA. Although he spoke openly with AméricaEconomía, he was pushing the bounds of acceptable military behavior, and asked not to be identified to avoid punishment. Zarza arrived at SOA in the second half of the 1990s, and he admits that when his superior recommended him for the course on intelligence, he knew little to nothing about the school. His education, up to that point, had been in the line of duty, and he was often on the front lines of the battle against drug trafficking. "For me, it was a scholarship to go to the United States. I wasn't high ranking and I didn't have any specialty in the field, but I had the highest grades in the preparatory courses, so in spite of the complaints of higher ranking officials, I went to Fort Benning," he says. Some time thereafter, he ran into the institution's history when he saw his name and rank on the Internet, as part of a list of former students that various NGOs make public. "I can't speak to what happened at the SOA in the past, but when I attended courses, I didn't see anything spectacular," he says. "I would even say that the courses weren't very good, and there wasn't anything new about the military policy. Mexico and the United States have very similar doctrines." Zarza doubts that it is possible to brainwash someone in the three or six months that students attend courses at the SOA. "We even had a Colombian instructor who advised us to be careful with the gringos, so that we wouldn't have the same problems as in Colombia," he remembers. He also affirms that he never encountered any teaching about torture techniques, nor suggestions regarding coups d'états. And how can we explain that neither Colombia nor Mexico, two countries who sent a substantial number of students to SOA, have had a coup d'état? See pictures of Colombia's guerrilla army. Zarza has a hypothesis. "Once, a South American soldier asked us how we resolved the problem with the Indians. We responded 'we are the Indians,'" he says. He thinks that the fact that the military in Chile and Argentina pulls from the upper classes increases the risks of a military coup. In Mexico, in contrast, "whoever enlists in the military does it either out of necessity or calling." In 2006 SOAW, led by its founder, the Catholic priest Roy Bourgeois, and the organization's Latin America specialist, Lisa Sullivan, managed to get Argentina to stop sending students to SOA, which is currently located at Fort Benning in Columbus, Georgia. "The School of the Americas has done a lot of bad things, and it continues to push the idea of a 'war on drugs' and 'war on terrorism,'" said Argentina's then-minister of defense, Nilda Garre, during the official ceremony that made the decision law. In Argentina today, terrorism and drug trafficking are problems that are tackled by the police, not the military. Later, Bolivia, Uruguay and Venezuela followed Argentina's example and stopped sending students to SOA. For Kimberly Nolan, a researcher at the Center for Economic Research and Teaching of Mexico (CIDE), it is possible that both the military and SOA's critics are telling the truth. U.S. interests and the role of the military in Latin America have changed since the 1980s. "The United States doesn't think as much about the region. Latin American countries are already democratic and stable," she says. The focus indeed has shifted from the fight against communism to the fight against organized crime. But if ever the War on Drugs goes the way of the Cold War, the SOA will find itself a military school without an enemy for its blackboards. Is China the Least Happy Nation on Earth? Bavaria's Calendar Girls: Is this How to Save European Agriculture?